In a November 1988 amendment to the Morris County Solid Waste Management Plan (Plan), the Morris County Board of Chosen Freeholders designated the Morris County Municipal Utilities Authority (MCMUA) as the implementing agency for the Plan. As such, the MCMUA runs certain solid waste programs for Morris County, and the MCMUA also performs planning functions related to maintaining and updating the Morris County Solid Waste Management Plan on behalf of the Board of Chosen Freeholders. The Plan serves as a blueprint for how Morris County implements its solid waste management strategy with respect to waste reduction, recycling and disposal. It describes requirements for providing garbage disposal for Morris County waste generators and establishes mandates and goals for keeping recyclables separate from garbage. Additionally, the Plan lists all solid waste facilities located in Morris County that require Plan inclusion prior to starting solid waste management activities as required by the Solid Waste Management Act. (N.J.S.A. 13:1E-1 et. seq.) and regulations promulgated by NJDEP (primarily located in N.J.A.C. 7:26 et. seq.). In accordance with state regulations (N.J.A.C 7:26A-1.4), some limited recycling activities are exempt from needing NJDEP solid waste division approval prior to operating. Additionally, some of these limited recycling activities may commence without first obtaining and Morris County Solid Waste Management Plan inclusion or consistency. Click here to read a summary of these regulations or Click here to go to NJDEP's website containing NJ's solid waste and recycling rules and regulations to read the specific regulations. Call NJDEP's planning office at 609-984-3438 for more information about notifying and operating as an exempt recycling activity/facility. Provided below are the three means of applying to Morris County to amend the Morris County District Solid Waste Management Plan (Plan) with respect to including a solid waste facility in the Plan. Guidelines For Evaluation of Solid Waste Facility Requests To Be Included In The Morris County Solid Waste Management Plan utilized by the Solid Waste Advisory Council in formulating its recommendation to the Board of Chosen Freeholders. Originally adopted on September 16, 1998 this procedure was formally included as part of the Morris County Solid Waste Management Plan as part of the Plan Amendment dated March 2007. Blanket Inclusion Policy for Vegetative Waste Compost Facilities and Recycling Centers. Included in Plan amendment dated February 1993 and certified by the NJDEP on August 25, 1993. 7:26-6.11 Administrative actions concerning a district solid waste management plan. (a) Each administrative action taken relative to a district solid waste management plan or program shall comply with the requirements of this section. 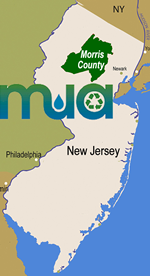 The inclusion of new recycling facilities for processing Class A or Class C recyclable materials (as identified at N.J.A.C. 7:26A-1.4(a)14), or replacement units at existing regulated medical waste facilities; i. The inclusion and/or expansion of recycling and compost facilities shall be, at the discretion of the district, subject to any previous blanket inclusion policies approved by the Department and shall be undertaken by the district in accordance with the approved district solid waste management plan. This paragraph is intended to supplement and not replace any previously approved blanket inclusion policy for a district. ii. Any blanket inclusion amendment approved by the Department shall contain a provision requiring, among other things, notification to the public as to the location for the receipt of written comments and the starting and ending dates for the written comment period. The expansion of capacity of any size, other than that specified at N.J.A.C. 7:26-6.10(b)8 and 10, for any regulated solid waste facility. Only one capacity increase over the operational life of the regulated solid waste facility may be accomplished via administrative action. Any other administrative action as may be identified by the Department. (c) Nothing contained in this section shall be construed to subrogate the district solid waste management planning process. The board of chosen freeholders or the Hackensack Meadowlands Development Commission, in its discretion, may hold a public hearing prior to the adoption of any administrative district solid waste plan action. (d) The board of chosen freeholders or the New Jersey Meadowlands Commission or the designated implementation agency of the affected district shall submit to the Department a letter that describes in detail the administrative action to be taken relative to the district solid waste management program. 1. The letter concerning the administrative action shall be submitted to the address at N.J.A.C. 7:26-6.10(e). (e) Upon receipt of a letter describing the administrative action, submitted pursuant to (d) above, the Department shall review the information provided. Within 10 working days of receipt of the letter, the Department shall notify, in writing, the entity that submitted the letter concerning the administrative action of its receipt of such letter. (f) The Department shall approve, modify or reject an administrative action within 30 working days of receipt of the letter describing the administrative action pursuant to (d) above, unless it determines that the described action is subject to the requirements for a solid waste management plan amendment pursuant to N.J.A.C. 7:26-6.10. In the event the Department fails to respond to a letter concerning an administrative action within the 30 day period, the administrative action shall be deemed approved. Administrative Action Request - October 2, 2017 request to include the CipCycle Class "A" paper recycling facility in the Borough of Rockaway in the Plan. Solid Waste Management Plan Amendment dated April 2017 that includes the Electronics Recyclers International ("ERI") Class D Recycling Center for Electronics Demanufacturing located in the Borough of Lincoln Park. Administrative Action Request - July 27, 2017 administrative action request to modify the Plan to include the request of Northeast Products facility located in Ledgewood (Roxbury Township) to accept up to 125 tons of leaves per day for transport to a leaf mulching site. Administrative Action Request - August 26, 2016 request to include the Kirk Allen Trucking, LLC vegetative waste composting operation located in Mt. Olive Township in the Plan to operate in accordance with N.J.A.C. 7:26A-1.4(a)13 which allows for recycling activities that are exempt from receiving NJDEP general approval. Administrative Action Request - A modification to the existing Jefferson Recycling Plan inclusion that adds the acceptance and processing of source separated Class B natural wood waste (trees, tree parts, stumps, brush and leaves) to its already approved acceptance of concrete, brick and block. Administrative Action Request - A modification to the existing Rotondi Plan inclusion that consolidates Rotondi's existing class "B" wood grinding activity; it operates on an adjacent lot, with its already permitted class "C" vegetative waste transfer station. Additionally, the acceptance of dimensional lumber, limited to unpainted and untreated wood as well as pallets, to the existing natural wood grinding operation, was added. Solid Waste Management Plan Amendment dated July 2013 that includes the County Concrete Corp. Class B Recycling Center for Concrete Recycling located in Roxbury Township. Solid Waste Management Plan Amendment dated January 2013 that incorporates the terms and conditions contained in an September 13, 2012, proposal submitted by Solid Waste Services, Inc., d/b/a J.P. Mascaro and Sons (Mascaro.) The Mascaro bid was submitted in response to a request for bids issued by the MCMUA on July 9, 2012, entitled, “Sealed Bids for Operating The Two Morris County Solid Waste Transfer Stations, Located In Parsippany-Troy Hills Township And Mount Olive Township, Including Providing Transportation Via Transfer Trailers And Alternatives For Intermodal Rail Containers And Disposal Of All Solid Waste Received At The Transfer Stations." Administrative Action Request - Plan Inclusion of Bednar Landscaping, L.L.C., Boonton, NJ class "C" composting facility (leaves and grass) managing less than 5,000 cubic yards per year of material generated exclusively by Bednar's own landscaping business. Jefferson Recycling, L.L.C. Plan Amendment to include the class B concrete recycling operation, Township of Jefferson (block 272, lots 8 and 9), Morris County, New Jersey into the Morris County Solid Waste Management Plan. Administrative Action Request - Plan Inclusion Clarification/Modification Morris County MUA - Class "B" & Class "C" Vegetative Waste Facility, Parsippany and Class "B" & Class "C" Vegetative Waste Facility, Mount Olive. RER Supply, L.L.C. Plan Amendment to include the leaf, grass and tree part class C transfer and class B processing operation, Borough of Riverdale (block 30, lot 1.03), Morris County, New Jersey into the Morris County Solid Waste Management Plan. Administrative Action Request updating August 1995 plan inclusion of FCR Morris Inc (now known as ReCommunity Morris) Class A recycling facility in Mine Hill incorporating single-stream recycling operations and associated changes. Administrative Action Request clarifying the inclusion of Novartis Pharmaceuticals incinerator to include the processing of solid waste types 10, 25 and 27. It also amended the operating hours of the incinerator to be 24 hours per day, 7 days per week. Solid Waste Management Plan Amendment dated January 2008 that incorporates the terms and conditions contained in an December 18, 2007, proposal submitted by Waste Management of New Jersey, Inc. (WM). The WM bid was submitted in response to a request for bids issued by the MCMUA on October 15, 2007, entitled, “Sealed Bids for Operating the Two Morris County Solid Waste Transfer Stations, located in Parsippany-Troy Hills Township and Mount Olive Township, including Providing Transportation via Transfer Trailers and/or Intermodal Rail Containers and Disposal of all Solid Waste Received at the Transfer Stations." Administrative Action Request allowing the Veolia ES Technical Solutions, L.L.C. facility (formerly Onyx and AETS) located in Mt. Olive Township to operate as a commercial collection facility for regulated medical waste. Response to the January 2006 New Jersey Department of Environmental Protection Solid Waste Management and Sludge Management State Plan Update - March 2007. In an NJDEP certification dated October 10, 2007, the Plan amendment was approved with the exception of the fee schedule for collectors of solid waste who collect commingled loads of solid waste and designated recyclables or who mix designated recyclables with solid waste. This was the only portion of the April 1, 2007, amendment to the County Plan that was rejected. Capacity Expansion of the two MCMUA transfer stations located in Mount Olive and Parsippany-Troy Hills townships. Blanket Inclusion of A-L Services, Inc. exempt Class "C" Vegetative Waste Compost Facility in Township of Jefferson. Exempt activity and therefore certification is not applicable. Solid Waste Management Plan Amendment dated June 2002 that incorporates the terms and conditions contained in an April 2, 2002, proposal submitted by Waste Management of New Jersey, Inc. (WM). The WM bid was submitted in response to a request for bids issued by the MCMUA on January 11, 2002, entitled "Operating the Two Morris County Solid Waste Transfer Stations, Located in Parsippany-Troy Hills Township and Mount Olive Township, Including Providing Transportation to Disposal Facilities and Disposal of County Solid Waste." Finally, this Plan amendment updates and/or deletes existing elements of the Plan, which are superseded by the implementation of the abovementioned transfer station operations, transportation, and disposal proposal by WM. Solid Waste Management Plan Amendment dated March 2002 that provides a capacity clarification for the two Morris County Shade Tree Department Class "B" and Class "C" vegetative waste recycling facilities located in Mount Olive and Parsippany-Troy Hills townships. Inclusion of Morris County Shade Tree Department Class "B" Vegetative Waste Recycling Facility (Camp Pulaski) in Mount Olive Township. Inclusion of Borough of Riverdale Class "C" Vegetative Waste Compost Facility in Borough of Riverdale. Inclusion of the former AETS, Inc and Onyx., now Veolia Environmental Services, ID27 solid waste transfer station in Mount Olive Township. Blanket Inclusion of CarpetCycle Company Carpet and Padding Recycling Facility in Dover. Blanket inclusion therefore certification is not applicable. Dan Como & Sons Exempt Compost Facility in Montville Township. Exempt activity and therefore certification is not applicable. Administrative Action reaffirming, without modification, the solid waste disposal system due to the final disposition of the Atlantic Coast waste flow control litigation. Utilization of Essex County Resource Recovery Facility with Associated Use of Transfer Stations and Out-of-State Landfill; and Follow-up to Response to the Task Force Report. Inclusion of the Randolph Township Drop-Off Convenience Site for Household Solid Waste in Randolph Township. Inclusion of Riverdale Quarry Class "B" Recycling Center in Riverdale Borough. Transfer Station Facilities - Capacity Clarification and RRIT. Amendment Pertaining to Plan Arising from the Acquisition of MCTS Transfer Station Facilities and Associated Real Property. Response to the Task Force Report. Inclusion of Mount Hope Rock Class "B" Recycling Center in Rockaway Township. Designation of the Morris County Dept. of Solid Waste Mgt. as the Morris County Implementation Agency. Plan Elements Arising from the MCTS Rate Case Amendment to Settlement Agreement dated 2/27/91. Inclusion of Morris County Consolidation Center in Dover. Inclusion of the Sandoz Pharmaceutical Small-Scale Incinerator in East Hanover Township. Inclusion of the Dover General Medical Waste Incinerator in Dover Town. Inclusion of Ox Contractors Stump Factory in Roxbury Township. Inclusion of Site 15 in Roxbury for Resource Recovery, Deletion of Site 6-1B in Rockaway for Resource Recovery, Sizing of Resource Recovery Facility at 1,340 TPD, etc. Also Included is the Response to Comments Document. Inclusion of Morristown Hospital Medical Waste Incinerator in Morristown. Inclusion of Chilton Memorial Medical Waste Incinerator in Pequannock Township. Inclusion of Rotondi Leaf Transfer Station in Chatham Borough, St. Clares Hospital Medical Waste Incinerator in Denville, Resource Recovery Investment Tax Fund Spending Program. Inclusion of Garden State Paper Facility (site now operating as Trinity Recycling) in Mine Hill Township.